Yarn Tails: Disaster? Or Just A Challenge? Disaster? Or Just A Challenge? So, I'm spinning along, minding my own business. I stop every now and then to admire the pretty colors and the (mostly) even singles. 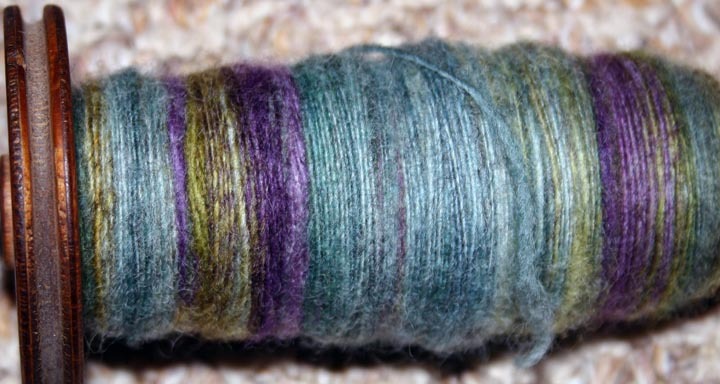 The bobbin is about 3/4 full; it's starting to stick a little and not drawing in evenly. So I think, "hmmmm, I'll change bobbins. Maybe a fresh one will spin better." Well, just about anything will spin better now. When I tried to take the bobbin off the wheel, the back popped off and flew across the room. Just a hunch, but I don't think they're supposed to do that. And there is no way it is going back on. At least not until the fiber is off of there. If I try to ply from this bobbin, will I end up with a tangled mess? Will the lazy kate hold it securely enough that I can ply from this as-is? Should I go bury my head under a pillow and hope the spinning gods will smile on me tomorrow? I don't know whether to laugh or cry. 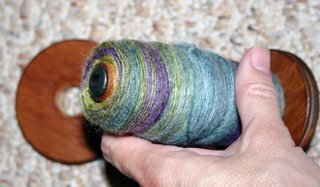 I would be inclined to stick the bobbin on a peg that is standing up (like one of those vertical papertowel or toilet paper holders) then put it on the floor and carefully, from above it, wind the singles off this spindle (perhaps using a ball winder if you have one or a nostipine or another spindle). It's very nicely done and I, like you, would not want to lose it. It is a challenge, but one you can handle. Just look at all that organizing you did recently! I feel your pain. The same thing happened to me a few weeks ago. I was able to jam the bobbin back together and continue spinning, and the next day I ordered more bobbins. 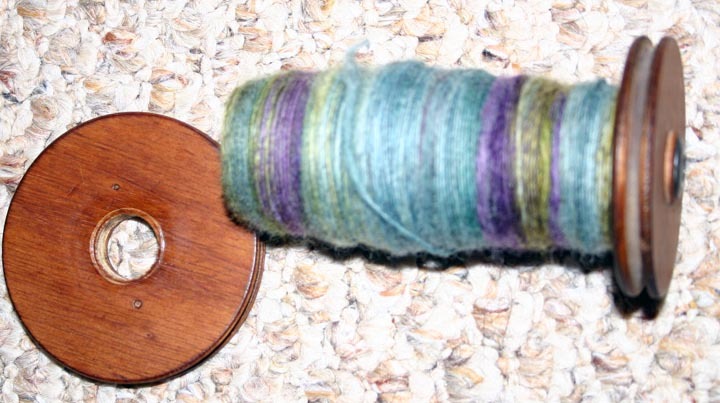 Can you wind the yarn onto another bobbin and ply from that? I would try to put it on the lazy kate broken side down, and do what Stephenie Guastad showed us, put a little weight on the bobbin before you ply so it won't pop up and down. :( is that from you wheel that you spent so much time fixing up? Wow, I've never had that happen before, I would have suggested the same as Catek. It's beautiful spinning though, you should be very pleased! I just noticed your Avatars pic has a little lamb in Paris. Love the little lamb. I haven't had time to play with the avatars, but I love them.